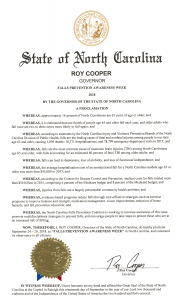 North Carolina Governor Roy Cooper has declared September 24-29, 2018 as Falls Prevention Awareness Week. Falls, which are preventable, have become a growing public health problem our state. Falls are the leading cause of fatal and nonfatal injuries among North Carolinians age 65 and older, causing 1,094 deaths; 18,771 hospitalizations; and 78,799 emergency department visits in 2017. The average hospitalization cost of an unintentional fall for a North Carolinian age 65 and older was more than $45,000. Falls Prevention Awareness Week, supported by many state, regional, and local health agencies raises awareness about how to prevent fall-related injuries among older adults. If you are an agency offering an event in support of Falls Prevention Awareness, Day, Week, or Month, please complete the following survey 2018 North Carolina Falls Prevention Awareness Week Events so we can list your activity on our HealthyAgingNC.com website. We will update events under the “programs” tab as we receive them every week through September 28, 2018. For Falls Prevention, please contact Ellen Bailey. This project was supported, in part by grant number 90CS0056-01-00, from the U.S. Administration for Community Living, Department of Health and Human Services, Washington, D.C. 20201. Grantees undertaking projects under government sponsorship are encouraged to express freely their findings and conclusions. Points of view or opinions do not, therefore, necessarily represent official Administration for Community Living policy. © 2016 | All Rights Reserved. | Website by AndiSites Inc.